The Buckeye State, long recognized as perhaps the nation’s premier presidential swing state, deserves its status. In the 30 presidential elections since 1896, Ohio has correctly picked the winner 28 times. Ohio has company at the top though — it beats out another top presidential swing state, New Mexico, by only a hair. Like Ohio, the Land of Enchantment has also only been incorrect twice, but because statehood arrived in 1912, its record is just 24-2, and thus it has a slightly lower batting average (92%) than Ohio (93%). The other states with the best records since 1896 are Illinois and Nevada, which voted with the winner 26 of the last 30 elections. However, Illinois is not a particularly good predictor anymore, as it is now consistently several points more Democratic than the nation as whole (the same thing appears to be happening in New Mexico, which has the nation’s most Hispanic electorate and which also has become more reliably Democratic). Another state that is not as reliable a predictor of the national mood as it used to be is Missouri, which The Economist rightly observed prior to the 2004 election had “an almost mythical reputation in American presidential politics” as a bellwether. That year, the Show Me State voted for George W. Bush, correctly picking the winner as it had in every election over the past century but one (1956, when it backed Adlai Stevenson over Dwight Eisenhower). But Missouri went against the grain and narrowly resisted Barack Obama despite his big win in 2008, and then it went comfortably for Mitt Romney in Obama’s second victory. The state now appears to be at least a few points more Republican than the nation as a whole. Generally, the states with the worst records since 1896 are the states of the Deep South. This is no surprise. In the early 1900s, most southern states voted for Democratic losers before turning Republican, while occasionally supporting third-party candidates in the middle of the century. Of the 11 states of the old confederacy, only two — Peripheral South states Florida and Tennessee — have correctly picked more than 70% of the presidential winners since 1896. Meanwhile, the only two states with a sub-50% mark in the last 30 elections are the Deep South’s Alabama and Mississippi. They are joined in the sub-.500 camp by the non-state that gets to cast electoral votes: Washington, DC. Since being granted presidential electors in time for the 1964 campaign, DC has had the same record of picking presidential winners (six of 13) as the party its voters have supported in all of its elections, the Democrats. Nearly half the states — 23 of 50 — are in the solid 70%-79% range, generally supporting the presidential winners while going against the grain a fair number of times. 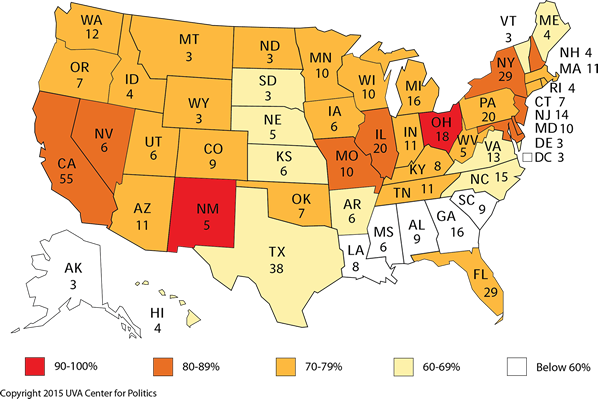 The record of the states since 1896 is reflected in Map 1 and Table 1. Note: Numbers on map indicate each state’s current number of Electoral College votes. Another argument for Ohio’s bellwether status is that its statewide vote has more closely mimicked the national vote than any other state for more than a century, according to Eric Ostermeier of the University of Minnesota’s Smart Politics blog. Ohio’s misfires came in 1944, when in the midst of World War II it supported Thomas Dewey — whose running mate was Ohio Gov. John W. Bricker — by less than 12,000 votes over FDR, and in 1960, when it comfortably preferred Richard Nixon over John F. Kennedy, the very narrow national winner. Ever since 1960 — over half a century — Ohio, alone among its peers, has a perfect record in picking presidents. New Mexico’s misfires are more recent: in 1976 it narrowly backed Gerald Ford in his close loss to Jimmy Carter as well as Al Gore in 2000 over George W. Bush. The 2000 margin — only 366 votes — was closer in terms of raw votes than Florida (won by Bush by 537 votes). Also, one could credibly argue that New Mexico did reflect national sentiment that year — it picked Gore, who won the national popular vote — but we’re grading the states by their support of the Electoral College winner, which was Bush. If one just included the last century’s worth of results — the 25 elections going back to 1916 — Nevada would be the king, with just one miss since then (1976, when the state and the rest of the west backed Ford over Carter). Three of the Silver State’s four misfires over the last 30 elections were supporting William Jennings Bryan (D) in his unsuccessful White House bids in 1896, 1900, and 1908. The populist Bryan performed well in the Democratic Solid South and parts of the Mountain West in his campaigns but never came particularly close to winning the presidency. The historical record is interesting, although using a metric based on more than 100 years’ worth of elections to determine which state will be the most predictive of the 2016 outcome isn’t the right way to go about it. The best predictor of the next election, for instance, might be a state with a below-average record over the past century: our home state of Virginia. After all, no state was closer to the national popular vote in the past two elections, although it’s possible that because of demographic changes — Virginia’s electorate is more diverse than the nation as a whole — the Old Dominion’s time as a bellwether could be fleeting. Note: This is an updated version of an article the Crystal Ball first published in 2011.